As you can clearly see, the World Map in God Wars V divides Gielinor into regions. Each region will be obtainable by both player and NPC factions through a variety of means: Conquest, Conversion, and Diplomacy. While most regions will be easy to capture at the beginning of the game, they will become more valuable - and more well protected - as space becomes scarce. Wild ("country"): These regions may have a few inhabitants or even small villages, but for the most part, they are untamed. Depending on climate and geography, these regions provide the best resource modifiers, but Gold income will be low. Settled ("town"): These regions have a town or other sizable settlements in them. They tend to offer an even mix of resource modifiers and income. 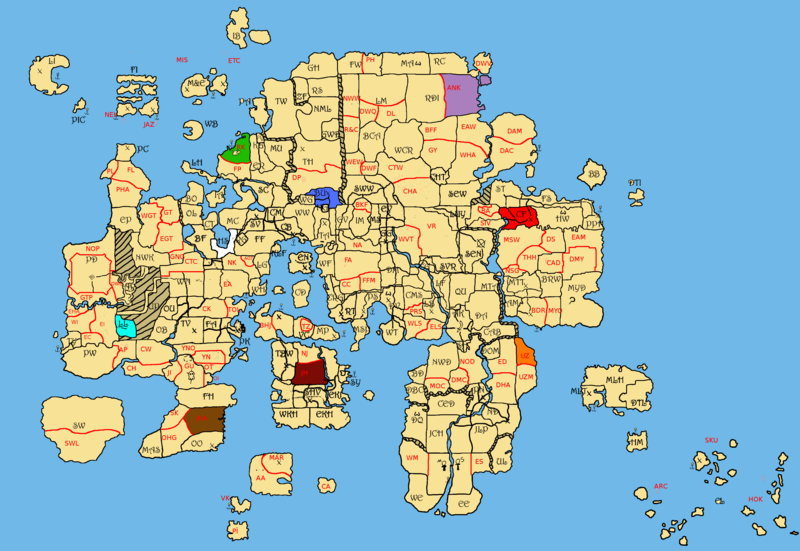 Advanced ("city")These regions have grown past the town threshold and have developed into full cities. While the resource modifiers are very small in these regions, their Gold production is unmatched. Movement in GW5 is conducted by plotting a course on the world map. In other words, every army, Agent, and Caravan must move through a series of adjacent regions to get to its destination - think hexes in Civilization, or territories in Total War. Some routes will go through fewer, but more dangerous regions, while other routes will pass through many regions, but be safer overall. It's up to the player to decide which path to pick! To move an army, Agent, or Caravan, specify the route it takes in a turn post. Include all the regions it will be passing through and calculate the total trip length. When calculating trip length, include the region you're starting in and any regions between the starting region and the destination, but NOT the destination region itself; you're moving THROUGH the starting region and any regions inbetween, but you're moving TO the destination region, so it isn't counted. Unlike in GW4, soldiers can be sent into a region owned by another faction without immediately starting a war with that faction. This is due to the increased flexibility of the Diplomacy in GW5. Scouting plays an important role in planning and movement. Scouts aren't included in the main troop counts, but they can be sent ahead of an army to gather information on a region or even infiltrate enemy territories. Scouts can only investigate up to 2 regions per turn. They may also only investigate a region adjacent to one that you own. Of course, an army can move into a territory without scouting it out beforehand, but it might come across unexpected obstacles or enemies if it does so. Scouting is not foolproof, and your scouts may not be able to find all of the information you desire right away, if at all. A region that's being scouted doesn't have to be announced in the turn description, but you must state that you're scouting something. Roads can be built in regions, and these roads affect movement speed. Likewise, certain landscape features (swamps, thick forests, mountains) may inhibit movement speed. The GM will define any natural obstacles when the region is scouted by a player. Unpaved Region - Requires 2 turns to travel through. Paved Region - Requires 1 turn to travel through. Natural Obstacle - Adds 1 turn of movement to the total journey length. Naval movement is left to the GM's discretion, since the oceans are not divided up into regions! Large-scale teleportation is accomplished only with the use of Mass Teleport Lodestones (MTLs). These impressive constructs act similarly to Personal Lodestones in the Fifth Age, except their large capacity requires some Runes to still be used. All of the MTLs in your empire form a Teleportation Matrix, which other factions can access if you give them permission or if they become your ally. It's simple: If a region doesn't have an MTL, you can't teleport to it! In function, teleportation isn't much different than in GW4. Cost is variable; it's based on distance and the number of troops being teleported. Teleporting 1-3 regions away costs 3 Runes per soldier. Teleporting 4-7 regions away costs 5 Runes per soldier. Teleporting 8+ regions away costs 7 Runes per soldier. Siege Engines always cost 10 Runes each. The seasonal capacity of a basic MTL is 1,000 soldiers. Teleporting more than this amount will require another season, though the Rune cost for the total number of soldiers can be paid upfront. Unlike GW4, teleporting is completed instantly; once you teleport soldiers, you can order them to move from their destination immediately. William, the only reason I changed #6 from GW4 was to provide a bit more incentive to teleport. It seems like we're restricting its uses more with the seasonal capacity and the MTL requirement, so it shouldn't take all of 3 months to teleport 1,000 men. Archwizard Cathal sighed as he laid down the report in his hands. He looked up at the apprentice standing in front of his desk and looking at his feet. "What the heck was he thinking?" Cathal asked. The novice snapped out of his trance and mumbled something about 'demands of modern traffic' and 'increased need for magical solutions'. "So that's why his intestines are now spread on four different corners of the tower?!" the archwizard shouted. He'd had enough. Wizard Jokulhu had attempted to, without the archwizard's permission or knowledge, to expand the teleportation capacity of the wizard's tower by constructing additional lodestones around it. While testing the system, however, the late wizard had run into a problem. His body was torn apart and the pieces were sent to each of the nearby lodestones. What was left of the wizard would've fit into a matchbox. "Tear them down," Cathal commanded of the novice while dismissing him with a gesture of his hand. He'd certainly had enough. Lol, gf Jokulhu. I do intend the MTL capacity to be expanded through research, though. Probably "Lodestone Knowledge" as the Basic, and "Increased Simultaneous Magical Transfer of Contiguous Matter Compartments - AKA Bodies" as the Applied. Sure. I just wanted to voice what happens when you try to build more than one MTL in a region. » Looking for a post regarding polarity. » SOME CRACKING NEW MOVEMENT ON MY JUNIPERIS YAMADORI.